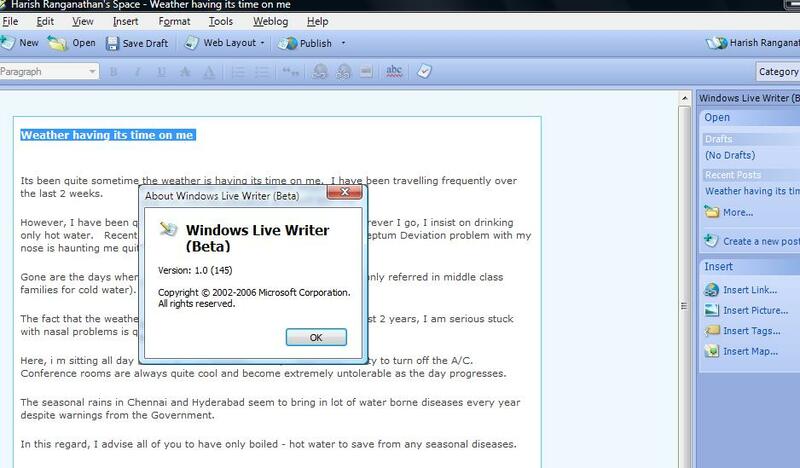 Windows Live Writer (Beta) - Cannot resist its simplicity!!! 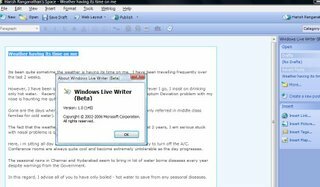 Windows Live Writer (Beta) is out !!! One of the coolest features is that, it is so simple in use and gives the comfort of working with a word document. I tried posting a blog to my MSN Spaces and it was really a cake-walk for a beginner like me using Blog Tools to post a blog. I have heard about other Blog engines like DasBlog, but I am sure when it is Microsoft's way, it always rocks similar to its other products. When I tried posting to Blogger, it had put a temporary post into my account for detecting the blog style settings. You can add more Weblog Accounts and switch between them for posting. In my case, I blog at 5 different locations including this and it really helps out to be at one place and post to all my accounts. # re: Windows Live Writer (Beta) - Cannot resist its simplicity!!! Good post. marketing assignment uk Thanks for sharing with us. I just loved your way of presentation. I enjoyed reading this .Thanks for sharing and keep writing. It is good to read blogs like this. As constantly, we appreciate yourself assurance and accept as true within us.